"We look forward to bringing a new level of service to Texas and the greater Southwest region," said Jason Hawkes, who will serve as ITR's SW Regional Manager. "It is always exciting when given the opportunity to help the world of business grow and prosper." Through the Dallas office, ITR will attend to Southwest region clients' needs with the highest degree of responsiveness. A local presence will enable ITR to offer availability for on-site planning meetings, consultations, and presentations, all of which will empower the firm's many valued clients to plan most effectively for the future, whatever the economic conditions. A valued member of the ITR team since 2015, Jason has extensive client-facing experience as well as training in economics. 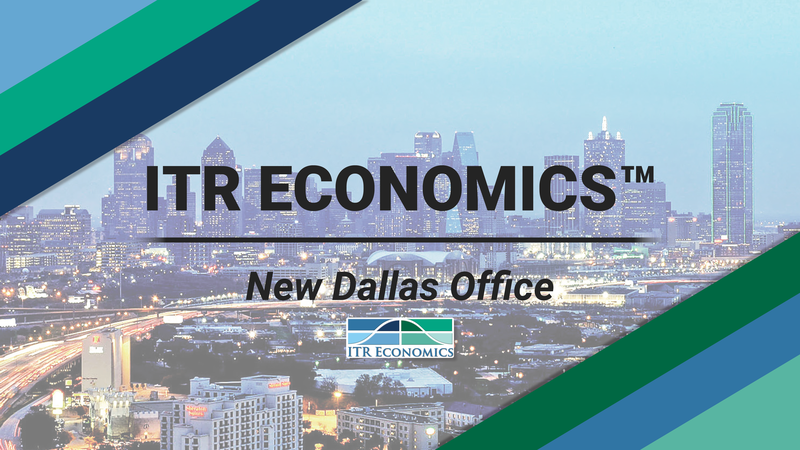 Taylor St. Germain and Sara Aybar, both key contributors to ITR Economics since 2016, will round out the Dallas team. An economic analyst, Taylor is also one of ITR's popular and dynamic speakers. He will be ideally located to provide his highly valued economic presentations throughout the Southwest. "I look forward to the opportunity to work with everyone in Texas and in the Southwest region of the US," Taylor said. "I hope we can be a great local resource for you all." Sara, a talented economist, serves a vital role in helping ITR clients understand the economic landscape. She said she is excited to bring a "personalized touch" to Southwest region clients' programs. "We hope to be an integral part of helping you build the best future for your business," Sara added. The Dallas team will bring a deeper understanding of local and regional economic influences and their potential impacts on sales and profitability for companies in the region. The team will also continuously analyze national and global trends so that local businesses have a clear understanding of their implications for the years ahead. ITR Economics works with firms across a broad swath of industries, including manufacturing, distribution, private equity, investment, and construction, as well as with companies in biotech and other high-tech industries. The Southwest is rich in business activity of all types and scales, and the ITR Dallas team is pleased to join the community and offer outstanding service, accurate forecasts, and practical, action-oriented analysis. For further questions, please contact Jason Hawkes, SW Regional Manager, at 603-796-2500 ext 224.